Two ONELAN projects have been shortlisted for EMEA InAVation Awards 2013. 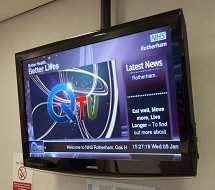 Universal AV’S ONELAN installation at NHS Rotherham has been shortlisted in the Most InAVative Public Sector Facility category and Sys-Teams’ ONELAN installation at Drain Center is a finalist in the Most InAVative Retail Installation category. ONELAN will also be exhibiting audience measurement, QR code content interaction, dynamic intelligent playlisting, player synchronisation and video on demand.